By wyjść z każdej opresji..
Melisa leaf (Melissae Folium) shows primarily antistress and cardiac activity. Contained in a leaf of melisa essential oil relieves stress and tension by strengthening the nervous system. 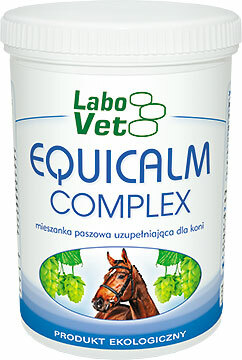 It also works relaxant in the gastrointestinal tract, taking part in the regulation of proper digestion. Hop cone (Lupuli Strobili) has calming properties. Active compounds of hop cone demonstrates activity in the gastrointestinal tract in regulating digestion with excessive enteric fermentation. Leonurus herb (Leonuri Herba), due to the presence in its composition precious natural active ingredients work gently calming and positively affecting the nervous system and work on the heart muscle. Also shows antispasmodic activity in the gastrointestinal tract, thus controlling the impaired intestinal motility in digestive disorders. 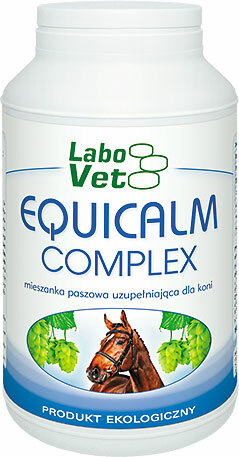 Administered orally after being mixed with wet feed. Adult horses: 2 times a day for 15g, ca. 1 attached measure. Foals: 1 to 7 g per day, ca. 0,5 attached measure. Ponies: 2 of 7 g per day, ca. 0,5 attached measure.